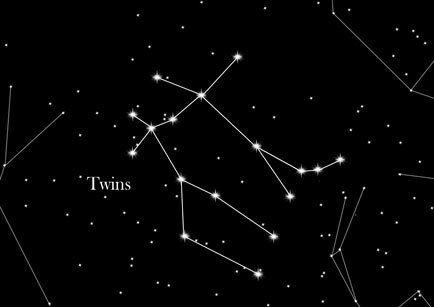 Gemini, also known as “The Twins”, is a very famous constellation of great astrological significance. Its northeast section is crossed by the Milky Way and it is easily observed during the winter when many large star clusters appear in the sky. Since the Gemini lies on the ecliptic line, the sun, moon and planets pull their orbits across the constellation. The twins appear as two people standing side by side. The heads of the two men symbolize the famous Roman Dioscuri: Castor and Pollux. Pollux, the brighter star of the twins, is only 34 light years away from us here on Earth. He shines orange and is a part of the famous Winter Hexagon. Castor is a multiple star system consisting of three main and three secondary stars. The names of the inseparable twins, originally derived from Greek mythology, are Castor and Polydeukes, which later became Castor and Pollux during Roman rule. Castor is the son of King Tyndareus of Sparta and Pollux the son of Zeus. Therefore one of them was mortal, while the other an immortal demigod. Together, the twins experienced a heroic adventure of the Argonauts which is considered to be the third great adventure in Greek literature after the Odyssey and the Iliad. However during an argument with friends, Castor was killed, whereupon Polydeuces asked his father Zeus to share the mortality with his brother. From now on, they spent their days in Hades, the underworld, once on Mount Olympus, the mountain of the Gods. In the name of their brotherly love, they were both placed in the sky. Astrological significance: People who are born under the zodiac sign Gemini are regarded as friendly and flexible. Extroverted and eloquent, they appear to some as superficial and capricious. Thanks to a fast perception, there´s no problem too taxing for a Gemini. The element of Gemini is the air.